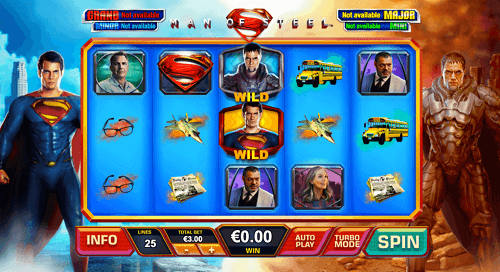 Join Superman as he fights General Zod to save the world while spinning the reels for great jackpots. This game is developed by Playtech and has exciting features for Australian players to enjoy. When playing this pokie, you will find, bonus rounds, free spins, and a chance to win a progressive jackpot. 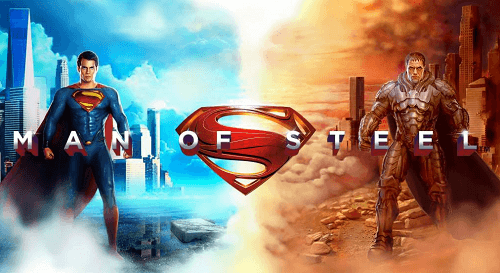 Man of steel is a five reels pokie game with 25 paylines that can reach up to 50 when playing in one of the bonus rounds. The game features five wilds that replace all the symbols on the reels except for the scatter symbol. The wild symbols include Superman, General Zod, Namek, Jor-El, Faora and the regular wild. All the wild symbols reward 1000 coins of five land on a payline. The Superman and General Zod wilds are shifting wilds. Superman will shift to the right while General Zod shifts to the left. When you land the Superman and General Zod wilds on the same row, it will trigger the Battle for Earth free games. Superman will fight General Zod and his warriors. In this bonus rounds, there are unlimited free spins and the two other wilds which are Zod’s sidekicks. These wilds are also shifting wilds. If they land on the same row as the Superman wild, a battle will ensue and create more wilds on the reels. The bonus round ends when Superman has been defeated. When the Krypton bonus symbol lands on reel five, it will trigger seven free spins. In this round, the paylines are increased to 50, and the reels are expanded. The Jor-El wild symbol will be locked on the reels for each spin. The symbols also differ from the base game are Krypton or alien inspired. If the Jor-El wild lands on reel five it will retrigger the bonus round. The World Engine symbol is the scatter and will unearth the regular wilds on the reels. However, this only applies if it lands on reel five. It will blast up to seven wilds. When you place a higher bet and create winning combinations on the reels, there is a higher chance of triggering the progressive jackpot. However, any spin at any amount can also trigger the jackpot. To play the jackpot game, you have to check the icons to reveal one of four coloured jackpot symbols. Each has a corresponding jackpot, whether it be a grand, major, minor or mini jackpot. Other DC Super Heroes slot games contribute to the progressive jackpot. You can also play them to try your luck at winning the jackpot.